This superb design evokes elegant parlors and libraries full of leather bound books. Traditional details like turned wood legs and a rolled wing back make this craftsman-quality piece destined to be an heirloom in your home. To keep it from looking too traditional, we offer a selection of bright, contemporary patterns to liven up your living room. 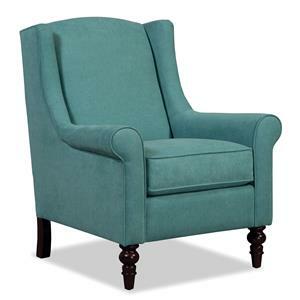 Chair is available with or without nailhead stud trim. The 074410-074510 Traditional Chair with Wing Back and Light Brass Nails by Craftmaster at Olinde's Furniture in the Baton Rouge and Lafayette, Louisiana area. Product availability may vary. Contact us for the most current availability on this product. Browse other items in the 074410-074510 collection from Olinde's Furniture in the Baton Rouge and Lafayette, Louisiana area.